Blowin' Up Toy Cars In Slow Motion! If only I'd had a Casio EX-F1 slo-mo camera as a kid. 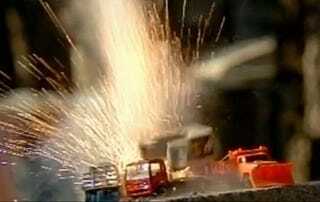 The awesome destruction of all those 1:24 scale model cars I stuffed with M-80s would have been captured! Sadly, Malaise Era kids had to settle for Super 8. Not so for this dude, who has captured some nice sequences of 1:64 toy cars getting blowed up and added the Ode To Joy as a soundtrack. In my opinion, this would have been more fun with cars that shatter into a billion fragments, but it's still pretty cool. Thanks to SLRSpeedShop, who also wishes he'd had a slo-mo camera as a kid, for the tip.